Bio-oil, produced by the destructive distillation of cheap and renewable lignocellulosic biomass, contains high energy density oligomers in the water-insoluble fraction that can be utilised for diesel and valuable fine chemicals productions. 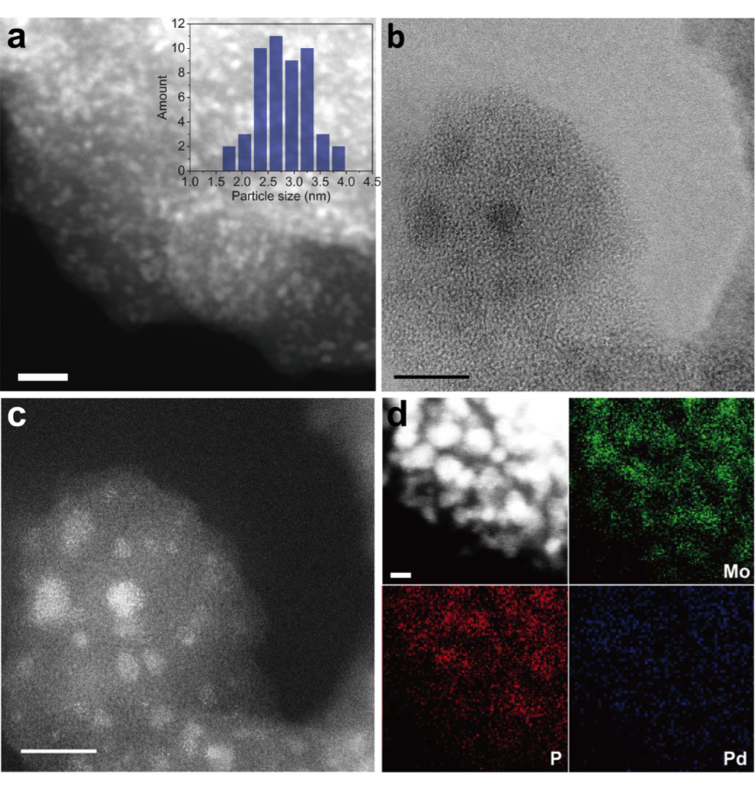 Here we show a highly active and stable hydrodeoxygenation (HDO) catalyst that combines atomically-dispersed Pd on a mixed-valent Mo5/6+ oxide phosphate on silica (Pd/m-MoO3-P2O5/SiO2). Using a wood and bark derived feedstock, Pd/m-MoO3-P2O5/SiO2 performs hydrodeoxygenation of lignin, cellulose and hemicellulose-derived oligomers into liquid alkanes with high efficiency and yield. Using phenol as a model substrate this catalyst is 100% effective and 97.5% selective for hydrodeoxygenation to cyclohexane under mild conditions, showing no decrease in catalytic performance after 63 hours under continuous flow operation. Detailed investigations into the nature of the catalyst shows it combine exceptionally high both Brønsted and Lewis acidic sites and facile Mo redox characteristics, we believe these are key features for the efficient catalytic hydrodeoxygenation behaviour. Catalytic performance on hydrodeoxygenation of phenol. a, Comparison of different catalysts at 383 K, 1 Mpa H2 for two hours in batch reaction. Reaction conditions: phenol (0.195 mmol), catalyst (including 0.00045 mmol Pd), decalin (7 mL), reaction mixture stirred at 800 rpm. b, Long-term stability test on the Pd/m-MoO3-P2O5/SiO2 at 453 K, 1 MPa H2 with a weight hourly space velocity of 0.085 h-1 in a continuous flow reaction. Polyethylene is the most produced plastic in the worlds with a production of over 80 MT every year. Slurry and gas phase plant around the world are the favourite meaning to obtain these polymers. We routinely study slurry phase polymerisation of ethylene using “in-house” inorganic support and complexes. Our target is a popcorn like morphology. Our solid catalysts are fully characterised by various techniques, solution and solid NMR spectroscopy, IR spectroscopy, SEM, ICP-MS, XANES, XPDF and EXAFS. 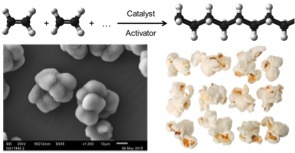 Hydrodeoxygenation of Water-Insoluble Bio-Oil to Alkanes using highly Dispersed Pd-Mo Catalyst, H., Duan, J. Dong, Y.-K. Peng, W. Chen, T. Issariyakul, W.K. Myers, M.-J. Li, N. Yi, A.F.R. Kilpatrick, Y. Wang, X. Zheng, D. Chen, S. Ji, Y. Li, J.-C. Buffet, S.C.E. Tsang and D. O’Hare, Nature Communications, (2017), 8, Article number: 591(2017). Ethylene Polymerisation using Solid Catalysts Based on Layered Double Hydroxides, J-C. Buffet, Z.R. Turner, R.T. Cooper, and D. O’Hare, Polymer Chem., (2015), 6, 2493-2503.